The Green Building Initiative (GBI) and the American Institute of Architects (AIA) now have a formal working relationship. The two groups signed a memorandum of understanding this spring, pledging to work together to promote the design and construction of energy-efficient and environmentally responsible buildings. Chris McEntee, executive vice president and CEO of the AIA credits “GBI’s engagement in life cycle assessment and promotion of post-construction third party review,” as reason for the MOU. The move is anticipated to make the Green Globes program better known, and to compete with other green building standards, such as LEED (administered by the National Green Building Council) and the NAHB Green Standard (administered by National Association of Home Builders and the International Code Council (ICC). After almost a year in the deep freeze, American companies report that credit markets are beginning to thaw. Economists say it’s a promising turn that could bolster the economy. Large corporations, which are able to issue their own bonds, are doing so at a pace not seen since the spring of 2008. According to the Dealogic, new corporate debt worldwide was $82 billion last week. That’s the highest since $103 billion last May, and nearly double the level seen right before the credit crisis in September. The movement hasn’t trickled down to small businesses though. Despite massive taxpayer-funded bailouts, bank lending remains at a trickle, partially because the banks are still suffering massive losses and partly because they’ve spent the bailout money on other items, like executive bonuses and payments to foreign banks. According to a story in Building Design and Construction, the idea is to charge a fee for new construction if it’s not built to LEED standards. Specifically, new commercial buildings 20,000 sq. ft. or larger could be fined up to $3.46/sf if not built to LEED Silver standards. Buildings that certified at the silver level would pay no fee, and buildings that achieve LEED Gold or higher would get rebates of up to $17.30 per sq. ft. depending on certification level. Perma-Crete now offers an online continuing education course (CEU) for architects, specifiers and engineers titled Polymer Concrete Surface Systems: A Green & Sustainable Solution. Perma-Crete is an acrylic-polymer concrete product with over 6,000 psi compressive strength, and can be applied to concrete, foam, masonry, aggregate, and steel. Because of low volatile organic compound (VOC) emissions, it can help projects qualify for up to 8 LEED project points. 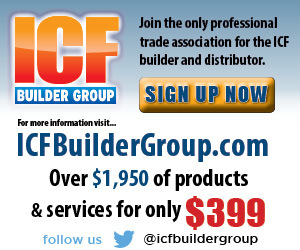 Financial difficulties, which have plagued the Insulating Concrete Forms Association (ICFA) for more than a year now, have forced the organization to close its headquarters near Chicago and lay off all its full-time staff. The Board of Directors has organized an ad hoc finance committee to resolve these difficulties and find a way to remain viable. In an “urgent” letter sent to all members, the board noted that the most likely scenario is to form a partnership with the EPS Molders Association (EPSMA) and the Alliance of Foam Packaging Recyclers (AFPR). The letter states that “ICFA already has tremendous synergies with both EPSMA and AFPR including complementary purpose, membership and target audiences” and says the move could reduce ICFA’s annual operating expense by up to $30,000. Vera Novak, technical and marketing director, resigned as a full-time staff member in late May. She indicated she will be working towards a post-graduate degree in a construction related field. Steve Heller, the executive director of the association since August 2007, is spending his final weeks facilitating a smooth transition to whatever new management plan is selected. In his two-year tenure, he established standard operating procedures and set ICFA on a firm legal footing. His other goals were hampered, however, by the severe financial mismanagement he discovered shortly after being hired. Despite his best efforts, the association has not been able to do much more than manage day-to-day operations. Because of these difficulties, the ICFA Expo, formerly scheduled for the last week in September, has been postponed. “A new conference date will be released within the next 2 to 3 weeks pending final negotiations,” the letter reads. The letter also formally announces the Primary Member Leadership Council (PMLC), comprised of the form manufacturers in the association, who are working to develop a mission statement for the association and develop ways to serve the different levels of membership. The economic depression that has crippled the construction industry appears to be easing but likely has not yet begun to turn around. The report from the National Association for Business Economics (NABE) “provides new evidence that the U.S. recession is abating, but provides few signs of an immediate recovery,” said Sara Johnson, who helped compile the report. More than half (55%) of respondents indicated the economy still hasn’t bottomed out, with 14% projecting their companies will see their lowest sales in 2010 or beyond. The current slowdown, which dates to December 2007, is the longest since the Great Depression and the deepest in decades. Most economists look for growth to return in the second half of the year, but they caution that the recovery is likely to be sluggish. The updated LEED rating system has now completely replaced the previous system. Leadership in Energy and Environmental Design Version 3 (LEEDv3) was finalized in April; the previous system (Version 2.2) was phased out completely by June. The new LEEDv3 places even more emphasis on energy efficiency and CO2 emissions than the previous system. It also marks the launch of a more reliable and faster LEED Online. The new LEED Accredited Professional (LEED-AP) materials provide specialized training for specific market segments. Training for LEED AP Homes and LEED AP O & M (Operations and Maintenance) credentialing has also begun. 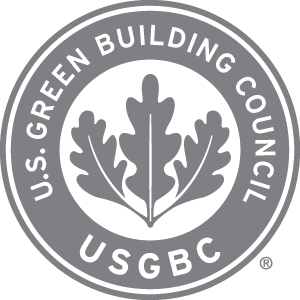 The U.S. Green Building Council (USGBC) new Washington, D.C. headquarters has been certified LEED Platinum. It is the first building to be certified under the new LEEDv3 guidelines. The USGBC moved into its new office in March 2009, which is triple the size of its previous space, reflective of the green building industry itself, which is projected to soar to $60 billion by 2010. “The vision of the space was to exemplify everything a LEED building is: high-performing, resource-efficient, healthy and productive,” said Rick Fedrizzi, President, CEO & Founding Chair, USGBC. 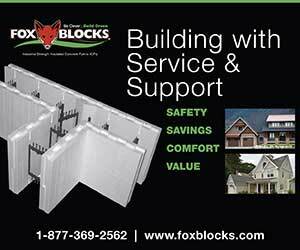 Hobbs Building System has renamed their product line as part of a comprehensive new marketing strategy. “We’ve rebranded our entire company and launched a new marketing campaign to better promote the benefits of our system,” explains company president Andrew Hobbs. 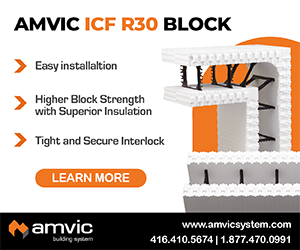 The insulating forming system, previously named E-Rated Walls, is now called the Hobbs Vertical ICF to differentiate it from the more common stacking block ICFs. “Our system is designed to make it easier for the removable forms contractor to transition to,” says Hobbs. “We’ve had quite a bit of success getting RCF guys to try our forming system.